Mohandas Karamchand Gandhi became known as the spiritual leader of India during the 'Indian indepence movement' - which included a wide spectrum of political organizations, philosophies, and movements which had the common aim of ending the British colonial authority. Gandhi pioneered 'satyagraha' — resistance to tyranny through mass civil disobedience, a philosophy firmly founded upon 'ahimsa', or total nonviolence. "There are many causes that I am prepared to die for but no causes that I am prepared to kill for." The most remarkable characteristic of Ganhi's hand is probably the very short pointer finger – a.k.a. 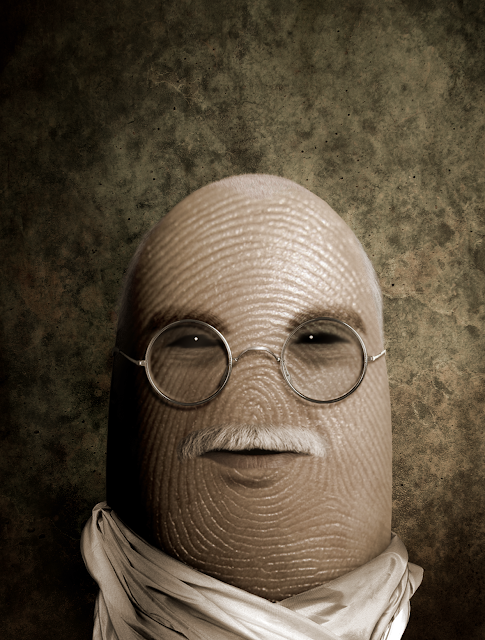 the finger of the ‘Ego’ or ‘Persona’. 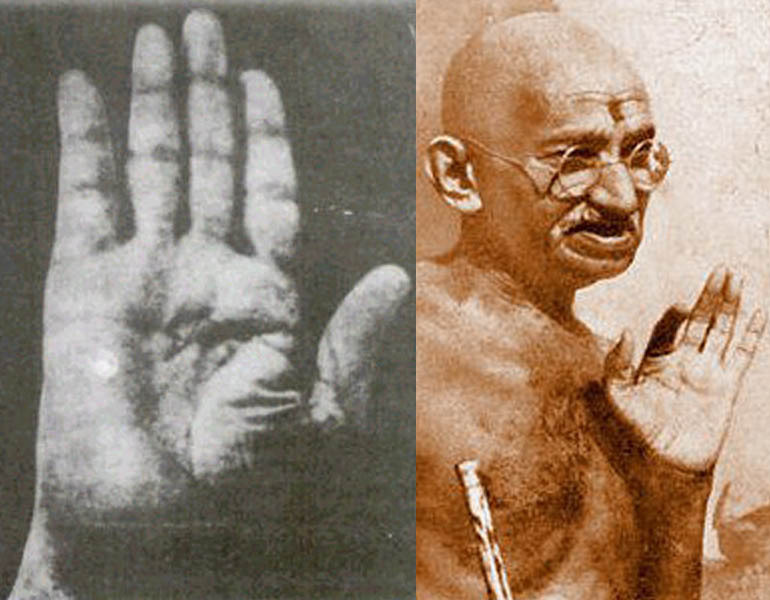 NOTICE: There are sources (books featured with inferior 'drawn pictures' of Ganhi's hands) claiming that Mahatma Gandhi had a so-called ‘simian line‘, but according the fundamentals of modern palm reading obviously the man didn’t have the notorious line in his right hand – nor his left hand. 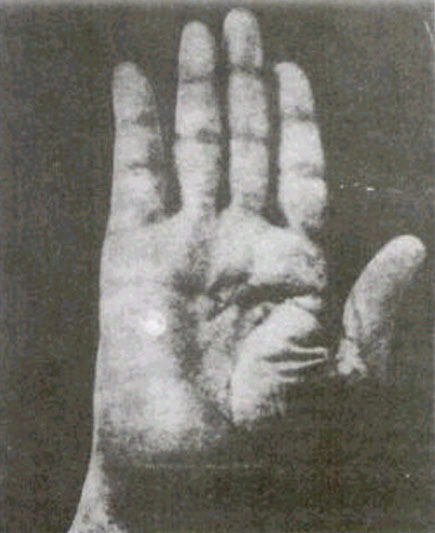 ]NOTICE: There are sources (books featured with inferior 'drawn pictures' of Ganhi's hands) claiming that Mahatma Gandhi had a so-called ‘simian line‘, but according the fundamentals of modern palm reading obviously the man didn’t have the notorious line in his right hand – nor his left hand. 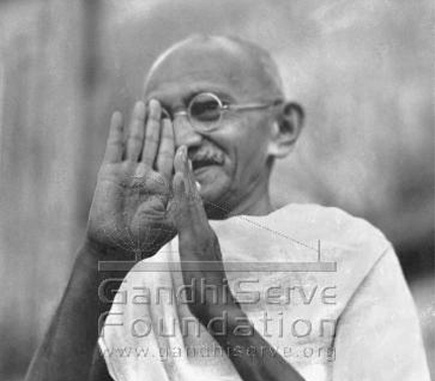 Hello Martijn...have you seen a clear LH image of Gandhi to decisively say that it doesn't contain a simian line? 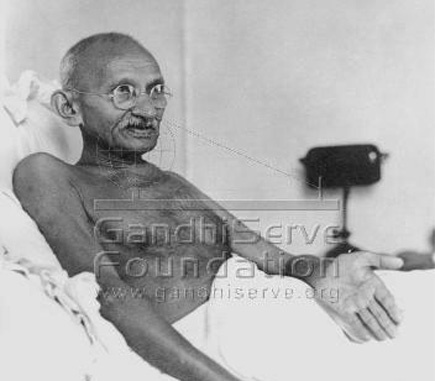 You mentioned Gandhi's LEFT hand, can you explain what you have in mind? Okay, thanks for explaining (now I understand what you have in mind). But I think the line that you recognized as a potential GOV (Girdle of Venus) ... is simply the heart line. Sorry, I see hardly any major difference when I compare the left hand with the right hand (the most significant difference between both hands is probably: the 'bridge' between the heart line & head line - which is obviously present in the right hand, but not present in the left hand). Anu_d, where did I make an assumption? I only described: I see hardly any differences between both hands. But the major reason why I believe that the line under discussion simply can not be a GOV is that the line is positioned at the (horizontal) level where the life line also starts .... which is actually a perfectly normal characteristic for a heart line! But not for a GOV - for GOV's are nearly always postioned much more closer to the fingers. Sorry anu_d, I see no reason at all for describing that line as a GOV. By the way, basically I don't understand why you are making the association with the GOV - by the way, so far you haven't described any detail which supports your hypothesis). ==>>Thank you for confirming that the photo is unclear and hence IMO it is not decisive evidence. The shape seen in the LH image is of a GOV...as defined in classical literatures......a little bigger than usual...but in the shape and location that is where a perfect GOV should be. Yes that's right Martijn.....in this picture the heart-line does look more like normal heartlines. Okay Anu_d, thanks for your confirmation. Ditology fingerprint art, including Mahatma Gandhi + many other celebrites! The B&W photo seems to suggest that the mounds of Venus and the Moon are rather large, but that's probably a function of the way he is holding his hand. 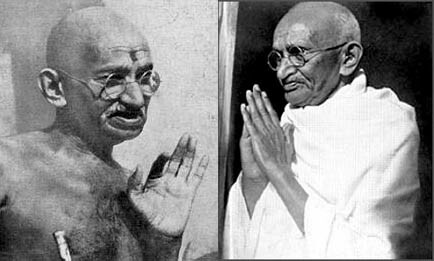 Interestingly, both photos seem to suggest a prominent lower Venus, so he probably had a propensity for sensuality, although he did combat his natural worldly inclinations which were often in conflict with his spiritual life. In the B&W photo the thumb also seems low set. The mercury finger is rather long suggesting he was adept at communication, which he was. Moreover, there is a suggestion in this photo that there is a Simian line but we refuted that through other images. I am wondering whether this B&W photo really does represent his hand? Has anyone checked it against other images of his right hand? You are right about the pointer finger though. An egoless man. Also, note that he was a left handed person. I did further checking and this is indeed the right hand of Gandhi.. A bit misleading as he did not have a simian line. although in this rendition the shadows make it difficult to see clearly. All his mounds were prominent, particularly Moon and Venus. But since he was left handed the right hand should not be the focus of the reading..